with a new theme and a dream team of teachers. Relive the golden days of spontaneous music making and share the joy with your 21st-century students. Reverse chord progressions to get under the hood of how chords work. Review old standards and discover how they are reincarnated in today’s music. Rethink scales and begin going down first. Reassess your studio curriculum and begin with big goals and work backwards. 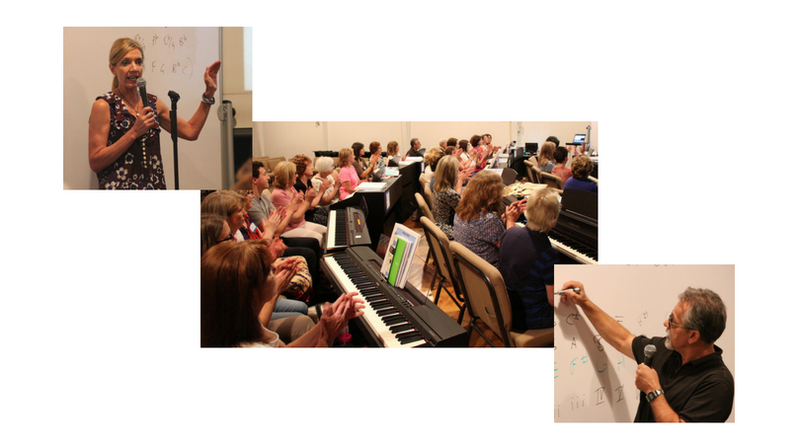 At 88 Creative Keys professional development workshops, piano teachers learn to improvise, use technology, lead off-bench activities, direct group teaching and acquire updated business skills with today's leading pedagogues. Unlike larger music education conferences, our workshops are limited to a small group of participants in order to maximize individual attention. SWING from sessions on building ear skills to sessions on developing better reading skills. RENEW your sense of balance as a professional musician and teacher. One that is first and foremost centered around creativity and teaching creatively. Watching someone do something you want to do in a video is kind of inspiring. Learning from others via a webinar or course is rather stimulating. Engaging with mentors face-to-face is downright life-changing. Both Bradley Sowash and Leila Viss are dedicated to helping others find their creative voice as piano players and teachers. That’s why we offer online products, lessons, blog posts, and hold quarterly webinars. However, deep down, we know that none of these experiences compare with an on-the-ground, interactive, hands-on, dynamic workshop. And that’s why we are offering a workshop again this summer with special guest, Forrest Kinney. It’s hard to explain the impact that Forrest has had on the piano teaching community. Here’s your chance to immerse yourself in his four-arts philosophy not just for an hour but for FOUR days! We know the commitment it takes to come to our workshops and we are thrilled that over half of our benches are already filled. Register now. You won’t regret it. We promise. with Forrest Kinney, Leila Viss, & Bradley Sowash. Expect a professional development workshop like none other--guaranteed! When: July 9 - 12, 2019, 8:30 am - 5:00 pm. Food: A light breakfast, lunch, and snacks. All well-balanced--of course! Materials: Included in the tuition. $25 Alumni rebate – Participants who have previously attended an 88 Creative Keys summer workshop qualify for $25 off! To redeem this offer, pay the full amount. Then notify us so we can refund the amount of the discount right away. Offer expires April 30. Cannot be combined with special offers not listed here. $25 Professional educator rebate – Music teachers who belong to a professional trade organization qualify for a $25 discount. To confirm your status, email proof of membership such as a picture of your membership card to a trade association such as MTNA or, Inner Circle. And yes, Alumnus and Professional educator discounts can be combined. To redeem this offer, pay the full amount. Then notify us so we can refund the amount of the discount right away. Offer expires April 30. Cannot be combined with special offers not listed here. $50 Bring your own keyboard - We can always use extra keyboards. That's why we'll send you a $50 rebate at the end of the conference for every keyboard you bring. (Limit 3. Keyboard must have a minimum of 61 keys.) Cannot be combined with special offers not listed here. Because we are a small boutique workshop, each student has a big impact on our planning and budget i.e. how many pianos to provide, how many meals to prepare, etc. However, we also understand that unforeseen circumstances may prevent a paid registrant from attending the workshop. So we are happy to offer a full refund minus a $50 processing fee provided we receive an email notifying us of the necessity to cancel on or before May 30. Registrants notifying us of cancellation on or before June 30 shall receive a refund for half the amount paid minus a $50 processing fee . No refunds can be offered on or after July 1. View the 2018 schedule for more details. Heard dynamic lectures that inspired, challenged, and refueled your perspective as a creative teacher and business owner. Engaged in deep group discussions on relevant topics like crowd control in group lessons, dealing with “that” student, business tips, performance anxiety, and more. Gained confidence in technology at the Genius Bar--a brand new addition to support tech questions and problems. Dug our heels in and developed your playing-by-ear skills--you CAN do it!!! Took the challenge and dived into playing lead sheets in various styles with confidence. Connected with like-minded teachers as well as Samantha, Thomas, Leila, and Bradley. Observed a lesson in “real time” and learned how to guide wanna-be improvisers and composers. Collected a list of teachable pop songs and learn ways to use them as a gateway to creativity. Developed chord fluency and build improvisation with interactive, hands-on seminars. Have you attended an 88 Creative Keys summer workshop or webinar? Please share your thoughts with prospective participants here. Forrest Kinney is devoted to bringing more creativity and joy into music education. He has written 39 books for teachers including 12 on the art of improvising, 10 on arranging, and two on creativity. He frequently gives presentations at music conferences. Forrest is a pianist who regularly gives concerts with his duet partner. He has played at the home of Bill Gates 27 times. Forrest has been a music educator for four decades. He finds teaching to be most fulfilling when he helps someone discover their unique gifts. Bradley Sowash is a jazz pianist, composer, multi-instrumentalist, recording artist, author known for his innovative online jazz piano classes, as the co-founder with Leila Viss of 88 Creative Keys webinars and workshops, and as the author of popular keyboard improvisation books published by Kjos Music. He also writes a column about improvisation for Clavier Companion and self-publishes works for ballet, big band, choir, film, orchestra, solo piano and string quartet.